Hairline-Thick and Natural Hair Transplant. The human eye looks for imperfections, changes in perceived patterns that alert the higher areas of the brain that something is amiss and that more of our attention is required right now. When encountering a pothole on the road we don’t focus so much on the presence of the defect itself, but rather how it disrupts the otherwise relatively smooth road all around it. In an instant, we know it’s bad and we automatically start working on the problem of understanding the threat. Such is the case for the hairline. The process of hairline recession is usually very uneven and visually disruptive. What used to be a defined line that evenly framed the face becomes tufts of irregular patches. Some thick, some thin, but all combining to command the attention of the person viewing it. How do you know this ? Because when speaking to people, especially new acquaintances, they seem to keep glancing back and forth to your hairline. Constantly. First your eyes, then your hairline. And repeat. You think they are being rude and are noticing your receding hairline. In reality their eyes are simply drawn to the ever increasing imperfection of your hairline as it matures and recedes. They are not necessarily being rude, but they are subconsciously making judgments as to your age, place in the social hierarchy, and other evaluations that are forced on the brain automatically and uncontrollably. You do the same thing. Guaranteed. It doesn’t take much to trigger this normal human mechanism in the viewer. Even someone with an excellent head of hair, save for one inch of hairline, will fall “victim” to this uncomfortable situation. This man in his fifties noticed slowly but surely that he was beginning to look different. At first he likely couldn’t put his finger on it. And why should he? He was ageing and small changes were to be expected. But these small changes were not staying small. He noticed the thinning in his hairline, but hey, he had great hair overall and he could always style it to cover the thinning hairline. But even strategy would being to fail. He had to do something so he sought out a hair transplant expert. Just one meeting with Dr. Steven Gabel of Oregon was enough to see what was wrong and what had to be done. Dr. Gabel is a true world class expert in hair loss evaluation and hair transplantation. 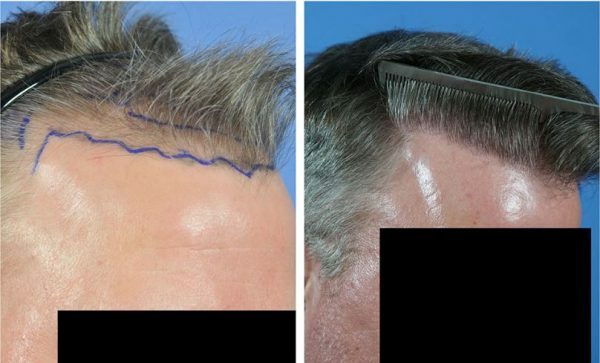 With patients literally visiting him from around the world he knows a “broken” hair line when he sees one, but best of all he knows exactly how to “fix” it. On examination Dr. Gabel could see where the old hairline was, there were plenty of remnent hairs to guide him. However, it’s never that easy, because some of those fine left over hairs have been around since the patient’s early twenties. This is where experience kicks in. 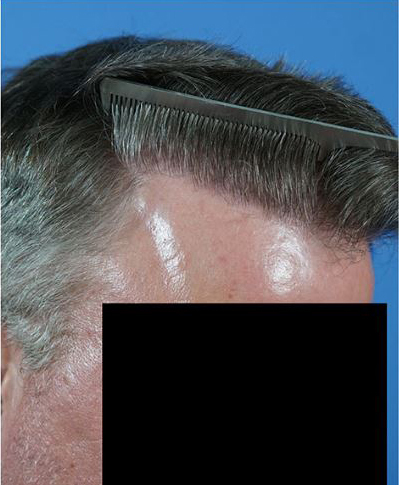 Dr. Gabel was able to use certain landmarks of the head and scalp to calculate not only where his hairline should be for his given age, but where it should be IF the patient CONTINUED to lose MORE of his hair. It is demanding balancing act and Dr. Gabel is a confirmed master of this ability. 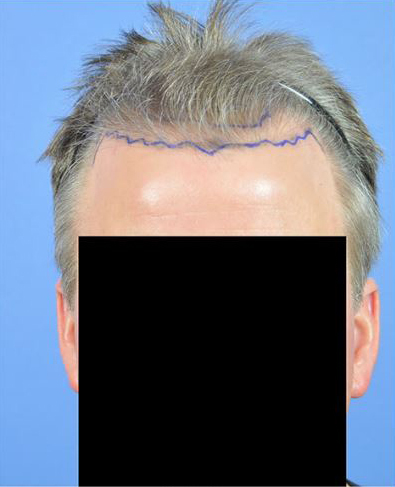 After drawing the proposed new hairline and explaining the plan to his patient they proceeded with a modern hair transplant. 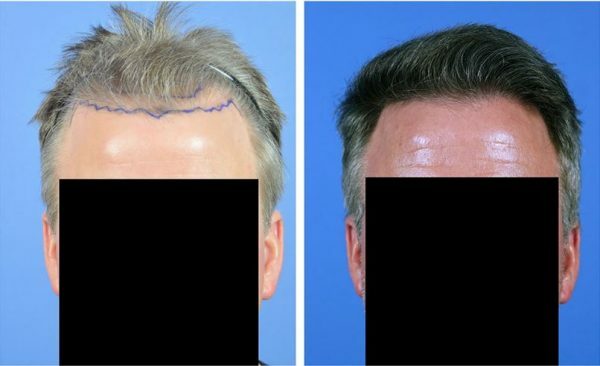 Dr. Gabel implanted thousands of grafts just in the hairline and most of them were single hair grafts-the hardest and most demanding grafts to produce and implant. The end result was nothing short of astounding. 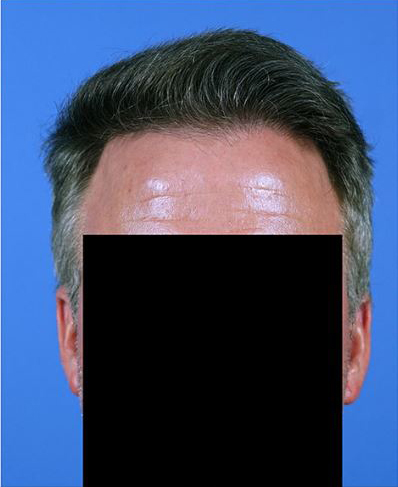 Even a close inspection could hardly reveal that this man had surgery, must less ever had a hairline problem.